Milwaukee Magnetic Tape Measures are nothing but Heavy Duty. Using Nylon Bond Blade Protection and a 5-Point Reinforced Frame, they offer the Longest Life by resisting contamination wear and increasing protection when dropped. To increase productivity on the jobsite, Milwaukee Magnetic Tapes feature Double Sided Printing with Blue Print Scale for easy reading and transferring of measurements. Additional innovative feature is the Finger Stop, which protects your finger when the blade retracts. Include A Free Extra 25 ft. Premium Magnetic Tape Measure (48-22-7125). 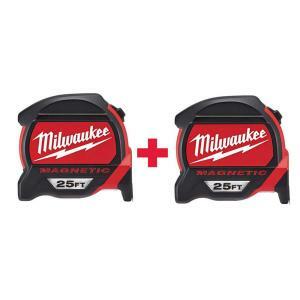 Tbook.com crawls the web to find the best prices and availability on Tape Measures and related Tools and Hardware products like Milwaukee 25 ft. Premium Magnetic Tape Measure W/ Free 25 ft. Premium Magnetic Tape Measure. For this page, related items include products we find that match the following keywords: "Tape Measure" at our vendor partner Home Depot. Milwaukee 25 ft. Premium Magnetic Tape Measure W/ Free 25 ft. Premium Magnetic Tape Measure is one of 111 Tape Measures and related products listed in the Tools and Hardware section of Tbook.com If you have any questions on this product, please give us a call at 734-971-1210 during the hours of 9am - 5pm EST for assistance. Thank you for shopping at Tbook.com, the Internet Department Store!